Knot A Podcast: Episode 18 from SewKnitpicky on Vimeo. Kittens, Vimeo is at it again: rage face. This time I actually did rant a bit, so that one might be genuine annoyance. Or illness. Take your pick. I had quite the two weeks, most of it wasn’t very pleasant. Between illness and stolen credit card numbers, we’ve been pretty busy at Chez Knitpicky. Add to that my increasing frustrations from trying to get hosted by Blip or figure out how to generate an RSS feed to get onto iTunes and well, this podcaster isn’t too happy right now–though I did learn a few other things that will be helpful in the long term. Maybe next episode I’ll talk about why I’ve been so timid to really come out as a PODCASTER and get into some of the details of all the work it entails. As is my nature, I want to do this… but 100% on my own terms. Which means I’m likely going to disappoint and not meet others’ expectations. ♥ Ravelry Group has 34 members! Yay! Thank you for joining me. ♥ Knit Picks’ security snafu. The not-really-an-apology from CEO Matt Petkun is here. I am still undecided if I’ll purchase from KP in the future. I might just pay the few extra dollars elsewhere that hasn’t lost my info and then failed to tell me about it for a month. ♥ This is technically from the end because I forgot, but I have caved in and joined Plurk as SewKnipicky. I am still trying to figure out the interface. ♥ And if you have been having issues with the sound on the podcast, please come tell me in the group or a PM. I can not fix a problem I’m unaware the extent or cause of. ♥ Pirate Patches – super easy crochet pattern that has been amusing my children for the last couple of days. ♥ Goodale – there is a light at the end of the tunnel! I should hopefully be showing this off as an FO next show. Whoo! And many apologies for how much my web cam hates teal. ♥ Hey Girl – new pattern by Chic Knits (Bonne Marie Burns) in this lovely Squoosh I could not pass up and have been sitting on since April 2012. It’s time to cast on some of my less aged yarn, amirite? ♥ Trying to figure out how to use these lovelies that have been marinating in stash since August 2009 (HOLY MOOSE). I will be opening a thread in the group to ask for pattern opinions. Knot A Podcast: Episode 17 from SewKnitpicky on Vimeo. Kittens, I had a hard time focusing this week. I’m going to blame the last couple nights without proper sleep. That’s reasonable…right? At least Vimeo did not capture me with rage face this week! Anywho, onto the show notes! ♥ The Ravelry group now has 27 members, most of them new-to-me. Thank for watching and welcome! ♥ The podcast was featured on http://www.knittingpodcast.blogspot.com run by Carla. Thank you, Carla! ♥ I signed up for a hand-painted sock yarn workshop in April. So excited to go to that! Come on, spring! ♥ Commission for my friend from, “Bea the Basement Monster Pattern,” by Rebecca Danger. ♥ Birthday gift for The Boy’s friend from, “Dot the Dress Up Box Monster,” by Rebecca Danger. I think this pattern could make an awesome Clefairy. ♥ Now that my pattern notes have been found, it’s time to focus on Goodale! ♥ Maybe some more socks for my kiddles? ♥ Annettle has a fun podcast, Gentle Ribbing, and a yarn shop, Soft Like Kittens. Love the bases from what I felt so far…and for the curious: yes, the little chocolate bar was tasty–but sadly, not fizzy. The “Hokey Pokeys” were sort of like puffed rice. Kittens, I’ve been meaning to do so many things and keep not finding the time to do them. So. I thought I’d work on the Stash post I mentioned in one of my last podcasts. The contents of my stash, and my feelings about said stash, have had a long time to develop and marinate. 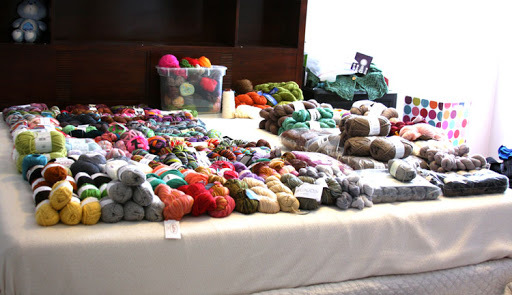 I started trying to be more mindful of it and track in 2009, when the Yarn Snobs Ravelry group did the first Stashdown. (It has since moved into a group of its own and become its own thing. It is a beautiful positive group and I whole heartedly encourage anyone interested to go check it out and join.) Since that time, I do not believe that I’ve had a single year where I actually reduced my stash…but I have learned a lot about myself and my stashing habits, which helps me be more mindful. I’m very much a process person, so not meeting the goal isn’t discouraging to me. I’m also a big ol’ nerd and like to collect data…as if that wasn’t already clear from my yardage tallies every month or the Stashdown posts I make. Some day I will compile all of this data into one glorious spread sheet. Color coded. With embellishments. Because that’s how I roll. 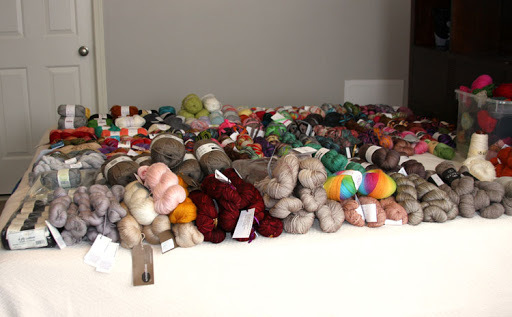 I wasn’t, however, quite prepared for how large a task it was to sort out and photograph my stash. After moving in June, I bought an Expedit unit, and Target carries bins that fit in it perfectly. (These bins are like Mary Poppins’ bag. My word, they hold a lot!) I have 4 of them that at the moment are very full. The Mister refused to be any where near our bedroom while I was working. He doesn’t want to know the truth about my yarn stash…bless his heart. I separated my stash into sweater lots (far right), sock yarn (back to mid-left) and then other small categories. There is a better picture of the sweater quantities side. As you can see, it’s quite a bit of stash. At the rate I’ve been knitting, I could keep myself busy for several years, at least. My initial feelings were confused. On the one hand, this was better than I had feared it could be, but on the other, it wasn’t as small as I hoped. I mean really, they’re 4 small 13″ * 13″ bins: how could they possibly contain all of that?! I was pleased to discover that while gazing at all of my lovelies laid out on my bed, I did not feel any shame or guilt about the purchases. I’ve come to a place where I really do like all of the yarn I own; it’s more a matter of finding the time to knit it all and to do so faster than I purchase. I also started reconsidering what my Stashdown goals have been. In the past I’ve thought the goal was to have only so many sweater quantities, skeins of sock, etc, in stash at one time. But in truth, my feelings about my sock stash very rarely change, nor do my plans. I will still make socks: I just may take longer or change my mind about the pattern a few times. On rare occasion, I fall out of love with a yarn, but it doesn’t happen often enough to be an issue. In the end, socks get made. The same can not be said about my sweater quantities and other project yarns. My feelings about color and pattern are constantly changing, which means that often by the time I get to using up a sweater lot of yarn, I’m either out of love with the color or the original pattern I wanted to use…and then I have a difficult time finding another suitable pattern for the yarn. Sweater lots often become Obligation Knits. I feel guilty not working with already existing yarn when I get something new that I want to cast on right away. The same happens with overly-ambitious-gift lots. I have several from Knit Picks that are languishing in stash and I’m finally thinking of ways to use. So I’ve decided to have a new plan: stash as little as I can manage this year while focusing on knitting up sweater quantities. Hopefully by the end of 2014, I can be down to no sweater lots in stash…then only purchase at the time I want to make a sweater and cast it on right away. It’s a lovely idea; getting there will be the tricky part. I will have to focus to make it happen.